What was your business’ New Year’s resolution, and how do you plan to keep it? At Google, ours is to help make the web work for you. Our new series of Learn with Google webinars will teach you how to use digital to build brand awareness, and they’ll give you the tools you need to drive sales. By tapping into technology that works together across your business needs, you can resolve to win moments that matter in 2013. Visit our webinar site to register for any of the sessions and to access past webinars on-demand. You can also stay up-to-date on the schedule by adding our Learn with Google Webinar calendar to your own Google calendar to automatically see upcoming webinars. During our last series of webinars, attendees had the chance to win a Nexus 7. Our lucky winner was Donella Cohen, who is happily enjoying her new tablet. Check out our upcoming webinars for another chance to win! Learn with Google is a program to help businesses succeed through winning moments that matter, enabling better decisions and constantly innovating. We hope that you’ll use these best practices and how-to’s to maximize the impact of digital and grow your business. We’re looking forward to seeing you at an upcoming session! The Google Crisis Response team has assembled a resource page to help track affected areas and provide updated emergency information for the millions affected by flooding in Jakarta. We also have a mobile page with emergency contact numbers and lists of shelters, and enhanced search results on google.co.id to provide information directly when people search. We’ve also included this information in our FreeZone service to reach affected users on feature phones. On both the page and map, which are available in English and Bahasa Indonesia, you'll see an update on flood locations and related data such as traffic conditions in areas affected by the flooding. To share the page or embed these maps on your own site, click "Share" at the top of the page. We’ll update the content as more information becomes available. The Surui people of the Brazilian Amazon had their first contact with outsiders in 1969. While the first encounter brought disease and deforestation, later contact helped bring about cultural preservation and environmental protection. Their tribal leader, Chief Almir, first came across Google Earth in 2007 in an internet cafe. He recognized its potential for conserving the heritage and traditions of his people that were being threatened by the deforestation of the Brazilian rainforest. He has embraced the mapping technology as a way to protect the rainforest and preserve his people's way of living. Check out their story below or read more here. Want to learn more about how other nonprofits are using Google for Nonprofits? Check out this full case study and others on the Google for Nonprofits site. If you’re interested in sharing your story, we’d love to hear it. Share it with us on our Google+ page. We are always excited to see how nonprofits use Google products to help change the world. One story that we think is especially inspiring is that of Chief Almir and the Surui Tribe. What historic cafe inspired a poem by a Nobel Laureate? In the last three barista world championships, which winners did not use beans from their home country? If you were preparing a blog post on “Curious Trivia of Coffee Culture,” how would you find the answers to these questions? What else would you discover? Now you can sign up for our Advanced Power Searching with Google online course and find out. Building on Power Searching with Google, Advanced Power Searching with Google helps you gain a deeper understanding of how to become a better researcher. You will solve complex search challenges similar to those I posed in my blog, or a Google a Day, and explore Google’s advanced search tools not covered in the first class. Oftentimes the most intriguing questions invite you to explore beyond the initial answer, and there’s no single correct path to get there. When looking for questions that can’t be solved with a single query, “search” can quickly turn into “research.” Google Search offers a palette of tools to help you dive deeper into the web of knowledge. 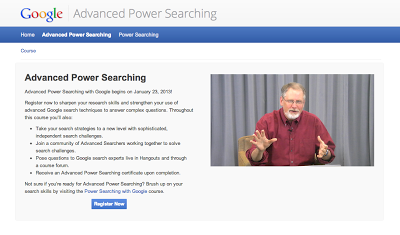 Visit www.powersearchingwithgoogle.com to learn more about our online search courses, and review our search tips on the Power Searching with Google Quick Reference Guide. Advanced Power Searching begins on January 23 and ends on February 8th.